If you're looking for a mild lift to for your suv, you've come to the right place! Ready Lift lift kits are an easy solution that easy to install, safe to use, and best of all, they maintain factory ride quality, quaranteed. 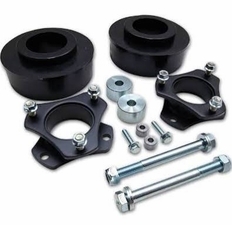 This ReadyLift lift kit achieves lift for your truck with an innovative strut extender that easily mounts on top of your oem strut assembly. Featuring Ready Lift's Smart Strut Technology, these strut extenders won't break or fail, unlike many cheap spacers and knockoffs of lesser quality. The rear is lifted thanks to another set of coil spacers. This simple solution means you won't have to compress your springs, and you can probably to the installation yourself in your own garage. Your ReadyLift lift kit will come with everything you need for a quick and easy installation. All necessary hardware, as well as detailed instructions that include photos, and a Lifetime Warranty are included. The part number for this Ready Lift front lift kit is 69-5060 and it fits 2003-2015 Toyota FJ Cruiser and 4Runner (no Trail Edition) 3" Front 2" Rear Lift, giving your truck a level stance while lifting it.